When asked why I don’t have children, aside from rattling off the traditional concerns of wanting to raise a child with a good man since I believe two parents are ideal or preferring to wait to ensure financial security, one of the most frequent arguments I encounter from other childless individuals within my 25-40 year old age bracket is the citation that it may not be the fairest decision to bring another innocent life into a world filled with such violent uncertainties including war, school shootings, horrific economic injustices, rampant drugs and intolerance. While the argument certainly feels all the more timely today, it’s curious that when I speak with much older friends and relatives, they offer the same exact reasoning that gave them a fertility pause decades ago. In fact, they tell me it was especially an oft-quoted political statement during the tumultuous Vietnam era and assassinations of prominent historical leaders in the 1960’s. And while it’s easy in this era of American-centrist news to naively feel as though this may only be unique to our citizens, it’s a fear that’s cropping up in the farthest reaches of the world where justifiably some are giving greater thought to starting a family by weighing pros and cons in a way that possibly hadn’t occurred to some individuals in both the United States and abroad to investigate that perhaps the near-mandate to grow up, marry, procreate, buy a home and continue working until death had larger moral implications to take into consideration. It’s precisely this same line of thinking that the type of world a child is born into may not be worthy of such an innocent creature that provides the earliest obstacle in the newly arranged Sri Lankan marriage between the twenty-two year old beautiful Shyama (Nandita Das) and her new husband in Indian writer/director Mani Ratnam’s award winning Film Movement selection A Peck on the Cheek. Although the nervous, introverted Shyama finds herself unable to make eye contact with her husband during their nuptials, the two find themselves falling easily into a joking, flirtatious rapport once they’re alone, however their early bliss as newlyweds is cut abruptly short by their war-torn country where explosions seem as abundant as the trees in the forest and their consistently dangerous existence inspires Shyama’s husband to state he wants to wait to give her the eight children she longs for until at last there is peace in the country. However, Mother Nature and fate have other plans and when war finds the young married lovers cruelly separated, Shyama is shocked to discover she’s pregnant and, in a country where the hospitals are in ruins and wanting the best for her daughter, Shyama’s father sends her away where she goes into labor upon her arrival in an Indian refugee camp in Rameswaram. Given the emotionally devastating prologue, I was completely unprepared for director Ratnam’s abrupt change in both tone and style as, following Shyama’s delivery, we cut to nine years later as her young, mischievous and fiercely independent daughter now named Amudha (P.S. Keerthana) lives with her two younger brothers along with her adopted wealthy, professional parents including the engineer and successful fiction writer Thiru (R. Madhavan) who publishes under the name of his television anchorwoman wife Indira (Simran). Set in a vibrant, colorful Madras, India, the film’s hauntingly lyrical beginning is wiped away by high-energy Bollywood production values, complete with musical numbers and the introduction of several characters—some far too confusingly quickly—until the film finally settles down into a more cohesive narrative as the nine year old Amudha learns on her birthday of her true origin and adoption. With emotions going overtime as she struggles to process this from feeling predictably betrayed to fascinated and worried how it will affect her life with her parents who adore her and had in fact, sweetly fallen in love while bonding over the young infant daughter who inspired her father’s most passionate story that secured his future wife’s affections. Driven by her concerns, Amudha makes some feeble attempts to run away and track down her biological mother until her parents decide to aid her in her quest to uncover her past as they journey to the still horrifyingly dangerous Sri Lanka to track down Shyama. While some of the Bollywood numbers, the overly manipulative score, and a few far too convenient plot devices detract from the emotional impact of the otherwise very solid film, Ratnam’s movie is filled with gorgeous little details including the way it flows forwards and backwards in time with its most successful segment following that powerful introduction as the compassionate outcasts Thiru, Indira and baby Amudha all seem to fall for one another simultaneously, thus reminding us that-- while the world can be horrifyingly cruel and bleak-- we must take every opportunity to love each other while we’re here and reach out to one another, often forming a family with those we wouldn’t expect. 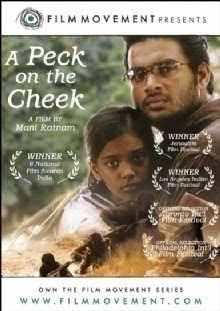 An excellent foreign gem to share with high school students and one that will definitely play even better to audience members who have experience with adoption, A Peck on the Cheek, which earned six national awards in its native India before screening at festivals around the globe has been recently made available to movie lovers here in the U.S.A. courtesy of Film Movement.